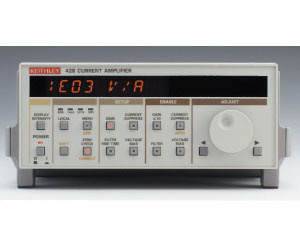 The Model 428 Programmable Current Amplifier converts fast, small currents to a voltage, which can be easily digitized or displayed by an oscilloscope, waveform analyzer, or data acquisition system. It uses a sophisticated feedback current circuit to achieve both fast rise times and sub-picoamp noise. The gain of the Model 428 is adjustable in decade increments from 103V/A to 1011V/A, with selectable rise times from 2µs to 300ms. The Model 428 offers fast response at low current levels, which is unmatched by either electrometers or picoammeters. The nine current amplification ranges allow the greatest flexibility in making speed/noise tradeoffs. The Model 428 can be used with any of Keithley s data acquisition boards to implement a very cost-effective, low curreent measurement system with wide bandwidth and fast response. The Model 428 incorporates a second-order Bessel-function filter that minimizes noise without increasing rise time on high-gain ranges. This can be defeated in situations where 6dB/octave roll-off is desired, as in control loops of scanning tunneling electron microscopes.